Urban planning and public-health research has long been interested in the connection between land-use mix and travel. Interest from urban planners stems from the potential of transportation efficiency gains achieved by an increased land-use mix and subsequent shortening of trip lengths; whereas, public-health research advocates an increased land-use mix as an effective policy for facilitating greater physical activity. Yet, despite the transportation, land-use, and health benefits related to improving land-use mix and the extent of topical attention given by researchers, no consensus has been reached regarding the magnitude of its effect on travel. This absence of agreement may largely be attributed to the theoretical and methodological failings persistent in present attempts to accurately reflect land-use interaction and operationalize its quantification within a defined spatial extent. To better evaluate the impact of land-use mix on travel behavior and assess more temporal policies, a robust mix measure accounting for these two elements of land-use interaction and geographic scale as well as a temporal element of land-use mixing—missing from present specifications—must be introduced. This paper establishes the research agenda for a spatial-temporal land-use mix measure by (1) identifying the conceptual and methodological faults inherent to current land-use interaction and geographic-scale representations and (2) describing strategies and practical benefits of representing the temporal availability of land-use mixing in guiding innovative transportation/land-use policies. Gehrke, S. & Clifton, K. (2015). 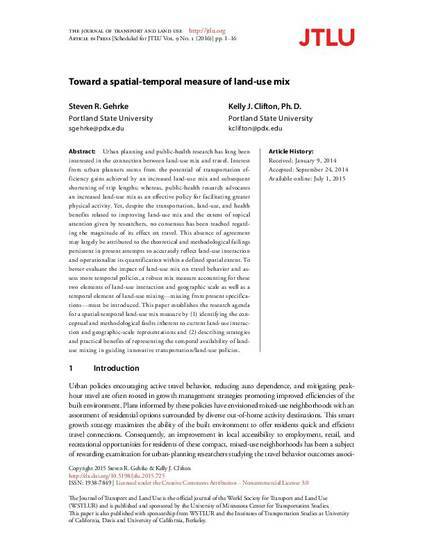 Toward a Spatial-Temporal Measure of Land-Use Mix. Vol. 9 No. 1.